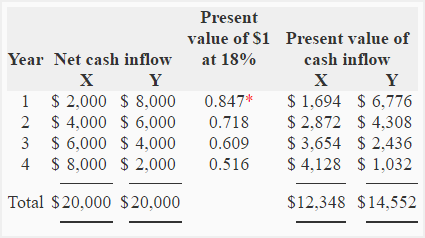 Compute the present value of cash inflows generated by both the proposals assuming a discount rate of 18%. 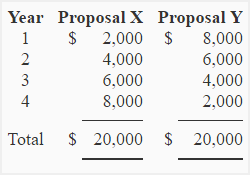 Which of the two proposals is better if compared using net present value method? Notice that both the investment proposals generate equal cash inflow of $20,000 in 4-year period but present value of proposal Y’s cash inflow is greater than the present value of proposal X’s cash inflow by $2,204 . The reason is that proposal Y generates most of its cash inflow in earlier years whereas proposal X generates most of its cash inflow in later years. It reminds us that the money has a time value. The net present value of both the proposals are positive and therefore both the proposals are acceptable if evaluated using net present value method. The proposal Y, however, promises a higher net present value than proposal X and is therefore a better investment to choose. It is very useful presentation but I need more examples. All you did was give the present value of the cash flows, not the net present value, which should take into consideration the initial 40,000 invested. Both these investment projects have a negative NPV, since the cash flows barely cover the initial cost. The exercise was missing its second part in which the NPV of both the proposals was computed and compared.